"Lizzy Ratner is a contributor to the Nation, reporting on serious subjects like politics, education and the economy. Jen Nessel is also a journalist, a former political organizer and the communications coordinator at the Center for Constitutional Rights. 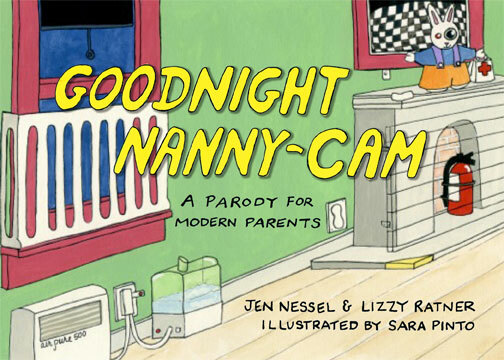 They are the mothers of Elias, 4, and Oscar, 8, and the authors of “Goodnight Nanny-Cam,” a new parody of the much-parodied children’s book (remember “Goodnight Keith Moon”?) that was first born as an essay in The New Yorker two years ago to skewer the affectations and anxieties of modern parenting. "How did you get the book so whimsically illustrated? "So what might you find in this book [...] For one thing, you might find a bit of yourself. Oh, sure, you’ll laugh at first. Then you’ll realize that you have half these products in your own well-thought-out nursery." - Amy Joyce, Washington Post.